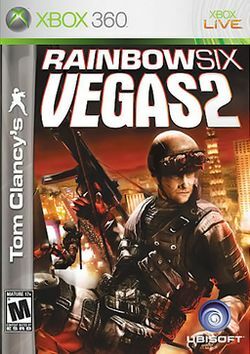 Tom Clancy's Rainbow Six: Vegas 2 is a tactical shooter video game and the sequel to Tom Clancy's Rainbow Six: Vegas. It was announced by Ubisoft on November 20, 2007. The game will be released for the Xbox 360, PlayStation 3, and Windows on March 18, 2008 in America and March 20, 2008 in Europe, except in Germany, where the game has been delayed. According to Amazon.co.uk as of the 17th March 2008 the PC version will not be released in the UK until 11 April 2008. A world-exclusive first-look of the game appeared in the January edition of the Official Xbox Magazine. One of the biggest announcements is that Logan Keller, the lead character from the previous game, has been removed in favor of having the player create his own character to play through the campaign. The player will assume the role of Bishop, a member of the Rainbow squad with a great deal more experience who is more deeply involved in the story. The game is billed as "part sequel, part prequel", as the events of the campaign run both before and concurrently to the story of Logan Keller and continue after where the first game concluded. New features include an enhanced version of the "Persistent Elite Creation" system. Players can now customize their character. Where in the first game, the player could only customize the multiplayer character, in this game there will be only 1 character for single player and multiplayer game modes. This further shows itself in the fact that experience points are now achieved through all the game modes, online as well as offline, whereas in the first game, XP was only obtained by playing the online multiplayer game modes. There will be a new sprint button that will allow players the weave in out cover at a quicker pace. But note that sprint only last for 5 seconds, and your armor will affect how fast you run. In single-player, the developers claim to have vastly improved teammate AI, so that now teammates cover each other as they advance. There are also several new commands, including the ability to suppress an area or throw a grenade at a specific point. In co-op, players will now be able to experience the full single-player campaign—the previous game skipped several cut-scenes and all of the in-game media (such as the picture-in-picture talking head briefings given out during each mission and Logan's responses to the NPCs). As a result, the co-op experience has been reduced to a maximum of two players, down from four in the first Rainbow Six Vegas. Unlike the co-op mode in the original Rainbow Six: Vegas, the AI teammates will remain in the game during co-op and can be given orders and go-codes by the primary player. It has also been revealed that the campaign will now focus on the seedier side of Las Vegas, with more outdoor combat and daytime missions. Also, certain missions will now see a real-time day/night cycle. Certain kinds of cover can now be penetrated by weapons-fire, and parts of the environment are now destructible. The player can now sprint for a short distance. Rather than two difficulty modes, the game now has seven. An additional system implemented in the game is the "Advanced Combat Enhancement and Specialization" or ACES, where players will be rewarded with different weapons based on tactics used in the game. The ACES system is divided into three parts: Marksmanship, Assault, and Close-Quarter Battle. Every single kill the player makes is organized into one of these three categories and scored based upon how the kill was performed (a headshot would count towards Marksmanship, or shooting through a wall would count towards assault, or killing an enemy while blinded by a flashbang would count towards CQB). By getting a high enough score in a category, the player unlocks a specific item for that category; for example, the Assault category might reward the player with a new type of grenade, while the Marksmanship category might reward the player with a new type of sniper rifle. Even though the ACES system goes across modes there are certain rewards that can only be unlocked in single or multiplayer. NEW ARRIVAL DATE- 3/18/08. Players who played the original Rainbow Six Vegas will be rewarded in Vegas 2. Those who reached the rank of Elite or completed the Story mode on Realistic difficulty will be rewarded with enough XP to obtain the rank of Private First Class. This page was last edited on 12 October 2016, at 21:30.